When playwright and actor Sam Shepard passed away last July at the age of seventy-three, his dear friend Patti Smith wrote a heart-wrenching remembrance of him for the New Yorker. In it, she mentioned a pair of tattoos they got in the seventies: a lightning bolt on her knee, and a crescent moon resting between his thumb and forefinger. 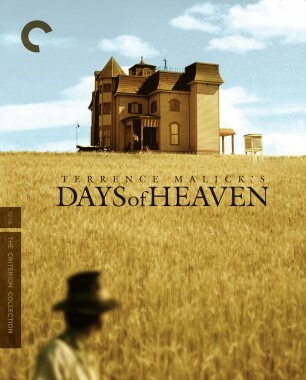 A few days after his passing, I found myself revisiting Terrence Malick’s 1978 masterpiece Days of Heaven. About a quarter of the way, my breath was taken by a moment in which Shepard’s character—an ailing, wealthy man simply referred to as “the farmer”—sits on a log in the woods with his soon-to-be wife, Abbey (Brooke Adams). He tells her he loves her, places his hand on hers, and there it is, thin as a wisp and gone in an instant, that sly crescent moon. The uncanniness of that glimpse reflects the mystery and delicacy of his performance. The first time we see him on-screen, it’s from afar. He’s standing in front of his mansion, a stately Victorian house on a tawny, grain-covered hill overlooking his miles of land. Bathed in an incandescent afternoon glow, it’s a scene reminiscent of Edward Hopper’s House by the Railroad and Andrew Wyeth’s Christina’s World. Shepard’s long, lean figure haunts the frame, and as the camera moves closer to him we see he’s neatly dressed in slacks and suspenders, eating an apple. Still yards away, we hear its crunch. Standing on his porch, he’s at a distance from the mass of workers descending on his fields, in an entirely different world. Throughout the film, Shepard lingers somewhere outside of its center of gravity. 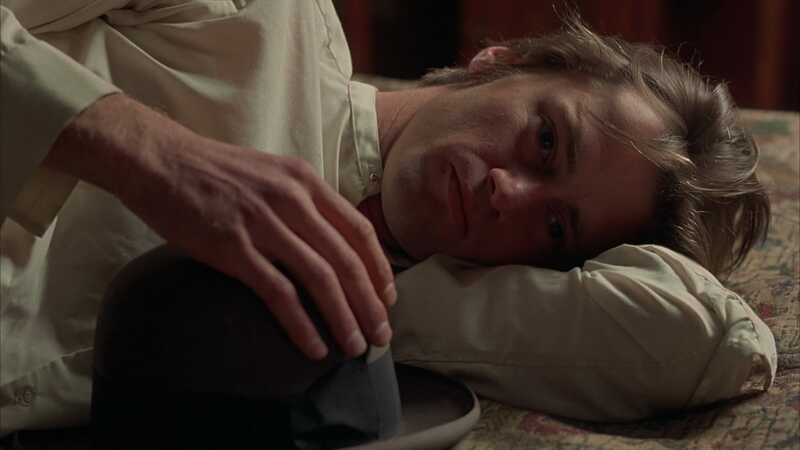 Set at the turn of the twentieth century, Days of Heaven is primarily focused on the relationship between a Chicago steelworker named Bill (Richard Gere), who has accidentally killed his supervisor, and his girlfriend, Abbey. 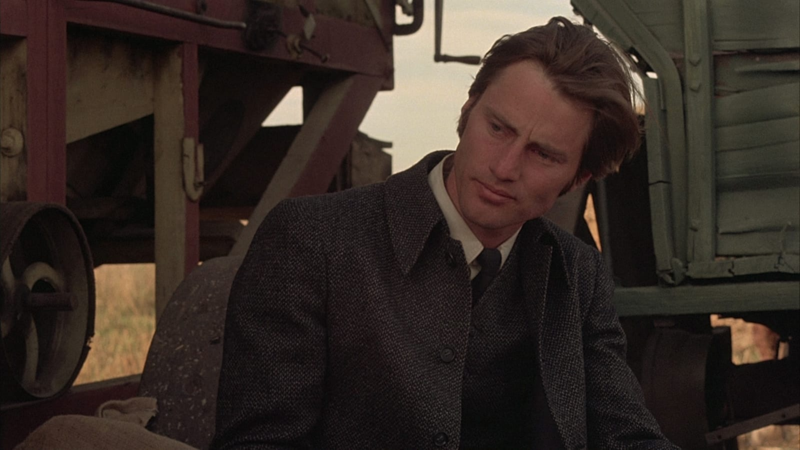 With his little sister Linda (Linda Manz), the couple flee to the Texas panhandle, where they find work in the wheat fields owned by Shepard’s farmer, who, it turns out, is fatally ill. Soon, Abbey must choose between her beloved partner-in-crime and the new man who has given her a life she never dreamed of. Malick’s dialogue is sparse and the character is shy, so Shepard does much of his acting through facial expressions, which are so subtle they barely feel like acting. His penetrating gaze seems to look beyond the camera. Like a silent film star, he can speak volumes without as much as a word. From certain angles he almost resembles a hawk—perched above the world, curious, but reticent to fly down and engage with those living beneath him. When he does speak, we hear the innocence of his voice, the near childlike sweetness in his slight twang, all hard r’s and soft vowels—an idiosyncratic accent adopted from his upbringing in rural California and the Midwest. He speaks simply, clearly, with intent and earnest curiosity. It’s interesting that Shepard made his screen breakthrough as a man whose social status isolates him from the struggles that make everyone else human, considering the actor would later come to be known for his emotionally visceral, rough-tongued characters—a reputation that echoed his own tumultuous upbringing at the hands of a violent father, who was a bomber in World War II. After escaping his family home as a teenager, Shepard had delivered newspapers in his ’51 Chevy before getting his ticket out of town when he joined the cast of a religious touring theater troupe that eventually brought him to New York. It was there that he began to discover his voice as a writer, emerging as a major talent in the early sixties and bringing ferocity to the off-off-Broadway scene with his Obie Award–winning plays La turista, The Tooth of Crime, and Icarus’s Mother. Shepard’s character seems to exist out of time—until he falls in love with Abbey. When he meets her, it’s as if he’s never spoken to a woman before, and perhaps he hasn’t, at least not with such intimacy and desire. Like many of Shepard’s men, the farmer feels like a relic from an earlier age. But where his other characters are marked by a world-weary disillusion, the farmer is striking for his innocence. And it’s the way that Shepard manages to merge his natural charm and earthy sensuality with the character’s ethereal nature that makes him so enchanting to watch. As a writer, Shepard had a longstanding interest in the tension between men and women, as well as the strained familial relationships that govern our lives. His plays are full of raw nerves and long-stifled emotions just beginning to burst at the seams. Whether in his writing or his acting, his characters are always physical and sometimes violent, and are frequently the creators of their own downfalls. In Days of Heaven, it’s love that turns to fire when the farmer realizes Abbey has deceived him. His jealousy becomes his fall from grace, breaking the spell of his early, quiet moments and turning him into something closer to the corrosive characters that came to define Shepard’s career. But even as his performance grows increasingly feverish, it’s the tenderness of the farmer’s first scene with Abbey that I keep returning to. It’s a moment that happens by accident, with Abbey stumbling through the grass outside the Belvedere. He emerges from the ground, as if rising up from nature to greet her. When he asks her where she’s from, there’s a sense of longing and sincerity in his voice. The way he looks at her is charged with a lifetime’s worth of desire suddenly awakened—“You make me feel like I’ve come back to life,” he’ll later confess. She tells him where she might be traveling after the harvest. “Do you think I’ll like it?” she asks. He pauses, and for the first time we see him laugh. Captured in this moment is something so tender and so tragic. From the beginning of the film we know that the farmer is going to die, that one way or another he will be gone by the time the credits role, yet standing there against that watercolor sky, he looks so alive you can almost hear his quickening heartbeat. Looking at his hand now, I cannot help but find myself momentarily removed from the film, thinking only of the man who lived outside of the frame. The tattoo appears as a remnant from a time before Shepard’s mythos as an artist became bigger than himself. Here he is, just a man who rented a Ford Mustang and drove it from California up to Alberta, knowing his life would never be the same.